Born in Sangju, Korea in 1952, Lee Seong-bok earned his Ph.D. in French Language and Literature at Seoul National University, then taught French Literature at Keimyung University in the city of Daegu. Since his first poem, "At a Familiar Brothel," was published in 1977, he has impressed readers with his opulent images of free association, unexpected transformations charged with aroused feeling and calling. The poetic world he presents, sometimes flamboyantly and sometimes serenely, is composed of events or scenes revealing the secrets of lives. 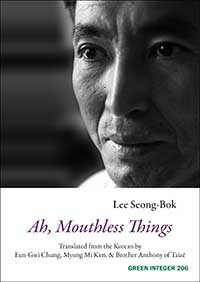 In 2003, he published Ah, Mouthless Things, now translated for the first time. Other books include When Does a Rolling Stone Awaken? (1980), South Sea Silk Mountain (1986), The End of Summer (1990), Memories of a Holly Tree (1993), Traces of Waves on the Moon's Brow (1993/2012), Raeyeoaebandara (Come and Share Sorrow) (2013), and a series of essays in three volumes: Poetry of the Polar Regions, Words at Odds, and Endless Blooming (2015). He has received the 1982 Kim Su-young Literary Award, the 1990 So-wol Poetry Award, the 2004 Daesan Literary Award, the 2007 Hyundai Literary Award, and the 2014 Yi Yuk-sa Poetry Award. Poet and translator Eun-Gwi Chung received her Ph.D. at SUNY-Buffalo. She is now a professor of English Literature and Culture at the Hankuk University of Foreign Studies, Seoul, Korea. Myung Mi Kim, a celebrated American poet of Korean origin, is Professor of English at SUNY-Buffalo and Director of their Poetics Program. Brother Anthony of Taizé, born in Britain, has been living in Korea since 1980, teaching English Literature at Sogang University (Seoul). He is now an Emeritus Professor there, as well as a Chair-Professor at Dankook University, and President of the Royal Asiatic Society Korea Branch.